Having a robust platform, the 2019 Ram 1500 pickup truck comes standard with dozens of active and passive safety features. 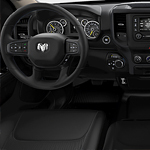 You can visit Dodge City Chrysler Dodge Jeep Ram to find out more details on this light-duty vehicle that's available with a full-size cab. Engineered to inflate in multiple stages, the front air bags respond to the severity of a crash. During a low-speed collision, these advanced air bags will deploy with relatively weak forces. The LATCH design is integrated into the car's anchor system for child seats. This Ram pickup truck is stabilized by the Electronic Roll Mitigation on a curved road with a steep gradient. When sensors detect a sudden shift in the vehicle's center of gravity, the wheels and steering will be automatically adjusted. An electric power steering system also makes it easy to regain control of this pickup truck. When you roll down an inclined path, the Hill Descent Control manages the braking power.